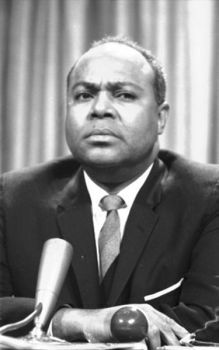 James Farmer was born in Marshall, Texas in 1920, the grandson of a slave, and son of a minister and college professor, who was believed to be the first black man from Texas to obtain a doctorate. Farmer obtained advanced degrees from Wiley College and Howard University. A staunch pacifist and opponent of the military, Farmer refused to serve during World War II. Farmer’s pacifism and belief in a racially integrated society steered him toward a life of activism. With colleagues George Houser and Bernice Fisher, James Farmer co-founded the Congress on Racial Equality (CORE) in 1942 in Chicago. The civil rights organization would eventually grow to 82,000 members in 114 chapters around the nation by the mid-1960s with Farmer as its executive director. CORE employed sit-ins, picketing, and other non-violent tactics modeled after the Indian protest movement led by Mahatma Gandhi. Farmer participated in the first CORE sit-ins in Chicago during World War II that ended discriminatory services practices in two restaurants. After the 1951 Supreme Court ruling that the segregated seating of interstate bus passengers was unconstitutional, groups of CORE members forced the issue of desegregation by deliberately sitting side by side in the fronts of buses. CORE’s tactics captured the imagination of many activists who would lend their support to the civil rights movement emerging in the nation in the late 1950s. Farmer led the organization until 1965. In 1969, James Farmer, a lifelong Republican, was appointed by President Nixon to the post of Assistant Secretary of the U.S. Department of Health, Education and Welfare. The former civil rights activist soon became uncomfortable with both the Washington bureaucracy — which he believed moved far too slowly on major racial problems — and with the Nixon administration which crafted policy at odds with his views. Farmer resigned in 1970 to work on his memoir and teach at Mary Washington College in Virginia, a post he held until failing health forced his resignation in 1998. Farmer authored two books, Freedom When? (1965), and Lay Bare the Heart: An Autobiography of the Civil Rights Movement (1985). In the latter book, James Farmer closed his final chapter on his life by saying, “living was tenuous in the movement days, but the grasping at liberty, and the reaching toward happiness ennobled life for this nation.” James Farmer died in 1999. James Farmer. Lay Bare the Heart: An Autobiography of Civil Rights Movement (Arbor House: New York, 1985); Richard Severo, “James Farmer, Civil Rights Giant,” New York Times, July 10, 1999. Civil Rights Giant,” New York Times, July 10, 1999.